I do not even know where to start… You might remember, that I crashed this year already two times on the racing bike (first almost breaking a newly purchased aero front wheel, then breaking a helmet and a special GPS mount) before we went to the USA. Soon after we came back, I participated in a very nice organised ride (accompanied by police motorcycles, so we did not have to stop at red lights, etc. ), which ended abruptly after 100 kilometres, when my rear tire exploded. But it was not just a flat. The outer tire fell off the rim, so I had to brake scratching the edge of the rim, and when I came to a full stop I had to realise that the inner tube is stuck in and around – in truly unimaginable ways – the cassette and that the aforementioned outer tire has a 15 cm long opening in the middle… It did not take much time to realised that the situation was hopeless (since no person carries a spare outer tire with him), so I was already about to call Clio and ask her to come and pick me up, when a random Flandrien came to me from over the other side of the street. He told me, mostly in Dutch, that he has a tire, and I can take it. Then – while I was still in disbelief – he invited me inside, and it turned out that he had a fully equipped garage with all the possible bike parts and even a proper bike stand, just like the one I have. He gave me everything I needed to repair my wheel (a file to smoothen the horribly scratched, sharp edges of my rim, and the exact same brand and type of tire I just destroyed), which still took more than a half hour to accomplish. Since I had no cash on me, I asked him to give me the number of his bank account and reimbursed him for all the things he gave me. But my misfortune was not over. Two weeks later while Clio was in Antwerp meeting up with a girlfriend for shopping, I went for a nice and easy afternoon ride. Just a day earlier, I did a big maintenance on the bike: cleaned it, rewired some brakes, changed the bottom bracket (for the first time in my life), installed new bar tape, trued my aero wheels (and even removed the decal stickers to make them look even slicker), etc. So there I was the next day, enjoying the silent (except for the sweet sound of the aero wheels slicing through the air) and smooth ride of my reborn bike the next day, when out of nowhere, I got a flat. Since recently I had gotten quite some experience in changing tubes, even before I came to a full stop I was already thinking: “ok, a 5 min break and we will back on track, no biggie”… But then when I started inspecting the front wheel to check if the flat did some damage to the outer tire too, I immediately noticed, that something was not right. And the shocking recognition came almost instantaneously: one side of the edge of the rim (which holds the outer tire in place normally) was completely broken, as if some previously hidden internal pressure or stress would have torn it away from the main body of the rim. It was probably some invisible damage from the crash earlier this year. It was unrepairable. Also, since Clio was not at home, I could not call her to come and pick me up, so accepting the situation, I started walking towards Leuven. I was in the middle of nowhere, with no buses or trains nearby, so there was not really another option. I was more or less 3 hours of walking from home… Luckily it was sunny, and relatively warm (for late September), so I did not have to worry about that, but it was still a long walk, especially in cycling shoes… After two hours, while I was already walking along the small channel which ends at the northern gates of Leuven, a guy picked me up and drove me home, saving me another hour of the cyclists’ walk of shame. You might think this was the end of bad things, and now I will write about the nice rides I have been doing afterwards. But nope. On the next weekend, I was on my usual Sunday morning group ride, and everything went fine until the last 500 metres, where I managed to not concentrate enough for two seconds on a downhill (I took my eyes off the road for a jiffy), which was just enough to miss noticing a car coming to a full stop 50 metres in front of me… I guess it is needless to say, that I crashed into the rear of the car (travelling with around 30 km/h). Luckily (or because I had gathered quite some experience in crashing too recently) I managed to fall along the right hand side of the car while my bike bounced to the side, and land in a way that I got nothing worse than a few scratches… My bike was a bit less lucky: I immediately noticed that the replacement mount I had just installed a week ago broke into pieces, and that my front wheel got a bit untrue (this was the front wheel of the wheel-set from which the rear wheel got damaged in the “tire explosion incident” you might still remember from a few lines earlier). Of course with this half the day was lost again, so I could not do anything but go for a short ride similar to the day before. Although it was almost the same route, I had some excitement when a dog started to chase me while I was going up on a slight climb… Luckily, I was still faster uphills ;) Then things really turned around, and on Thursday and Saturday, I managed to do two really nice, hard and epic rides. 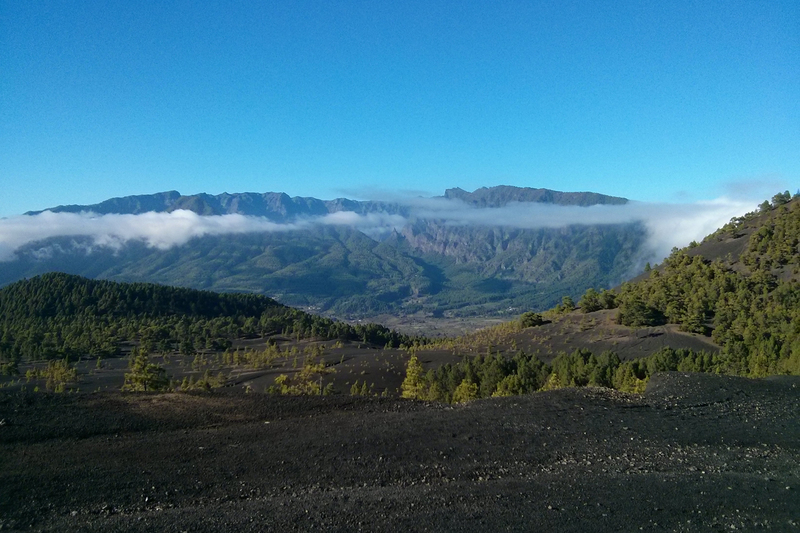 On Thursday I did a circle through the northeast of the island, climbed the Roque de los Muchachos from the North, and finished the day after 121.8 kilometres and 3621 metres of elevation gain. It was great. Then two days later I did a circle into the heart of the island, climbing the Roque de los Muchachos from the East, and on the end of the day, the second highest pass of the island from the West too (which I have never fully done before, especially not in good weather). This was my second hardest ride ever: 147.9 km and 4363 m of elevation gain, and even though I was a bit on the slow side, I am proud of the accomplishment. 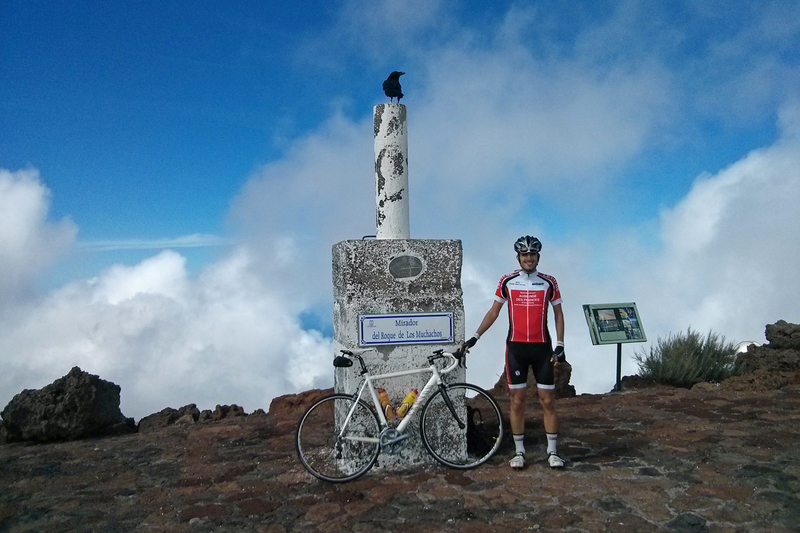 This entry was posted in Uncategorized and tagged crash, cycling, la palma, postdocinleuven on October 8, 2013 by Péter I. Pápics. Hát, Petikém, ilyen pechsorozat után egy időre abba kéne hagyni ezt a sportot, míg nagyobb baj nem történik.